Whether yoga is new to you or you are an accomplished yogi, you will enjoy and benefit highly from the specific detoxifying blend of yoga postures. The level of instruction is personalized to suit each individual. On a daily basis, you will have two meditation sessions and two yoga classes including asanas (postures), pranayama (breathing exercises), and relaxation techniques. You will be served breakfast, a light lunch and dinner; all based on simple, but pure and healthy vegetarian yoga food. The Monte Velho bungalows are very cozy and warm with comfortable beds. It is your decision if you want to stay in a single room, shared with one, or shared with three fellow yogis. All the rooms at Monte Velho are en-suite and are cleaned every day by the Monte Velho staff. To help the detoxifying process of your body, Algarveyoga uses special detox devices, foods, and natural supplements to help eliminate accumulated toxins. Yoga has a very detoxifying effect on the organs and the yoga classes focus on poses beneficial to the detox process. Diseases are born in the body and their root is often over toxicity (body pollution caused by heavy metals, pesticides, preservatives, and other foreign toxins). More and more diseases are caused by the modern lifestyle, therefore cleansing is an essential physical process that brings health and happiness. Through the combination of yoga and healthy vegetarian food, your body will receive a boost of life energy. You will leave the holiday with a deeper understanding of yoga, a healthy body, a relaxed and clear mind, and an open heart (and sparkling eyes). The detox not only happens on a physical level. You can also expect a body, mind, and heart detox! Diana studied physical education (ETH Zurich) and later became a qualified yoga teacher (Sivananda Ashram, Austria). In addition, she is a nutritionist (school of natural health science, Great Britain), Ayurvedic health and nutrition adviser (International society of Kamlesh Ayruveda), a massage therapist (Thai yoga massage, Indian head massage, Science of Yoga School, India), and a life coach (school of natural health science). 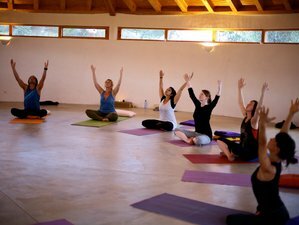 Algarveyoga offers all the yoga detox retreats at the majestic retreat center of Monte Velho. Located in the rolling hills of St. Vincent Natural Park in Carrapateria, Monte Velho sits on the western edge of Portugal and overlooks the great Atlantic ocean. Life in Monte Velho is kept down to earth, though it is a first class resort with a large yoga hall, sauna, and steam room. Every day, you will be served breakfast, a light lunch, and dinner. All is based on simple but pure and healthy vegetarian yoga food. All of Algarveyoga's retreats are free of wheat, yeast, refined sugar, coffee, black tea, meat, and fish. You will consume plenty of fresh juicy and delicious food, some of which comes straight out of the biological garden. Other spare time activities include hammock relaxation, nature walks, and salt water bathing. Alternative therapies like massages, foot reflexology, shiatsu, healing sessions, acupuncture, homeopathy, holistic horse riding, and life coaching are available for approximately 60 EUR per hour. Algarveyoga offers inspiring yoga holidays in the Algarve to help people tap into nature’s wonders in order to achieve health and happiness.